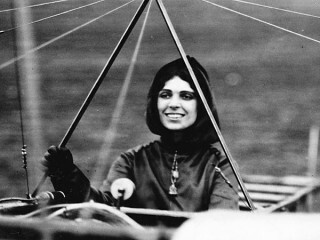 Birthplace : Arcadia, Michigan, U.S.
Harriet Quimby was an early American aviator and movie screenwriter. She was the first woman to gain a pilot license in the United States when, in 1911 she earned the first U.S. pilot's certificate issued to a woman by the Aero Club of America. Less than a year later, she became the first woman to fly across the English Channel. Although Quimby lived only to age 37, she had a major impact on women's roles in aviation. After her family moved to San Francisco, California in the early 1900s, she became a journalist. She moved to New York City in 1903 to work as a theatre critic for Leslie's Illustrated Weekly, which published over 250 of her articles over a nine-year period. She became interested in aviation in 1910, when she attended the Belmont Park International Aviation Tournament on Long Island, New York and met Matilde Moisant and her brother John, a well-known American aviator and operator of a flight school. On August 1, 1911, Quimby took her pilot's test and became the first U.S. woman to earn a pilot's certificate. Matilde Moisant soon followed and became the nation's second certified female pilot. In 1911 Quimby authored five screenplays that were made into silent film shorts by Biograph Studios. All five of the romance films were directed by director D.W. Griffith with stars such as Florence La Badie, Wilfred Lucas, and Blanche Sweet. She had a small role in one other movie. The Vin Fiz Company, a division of Armour Meat Packing Plant of Chicago, recruited Harriet as the spokesperson for the new grape soda, Vin Fiz, after Calbraith Perry Rodgers' death in April 1912. Her distinctive purple aviatrix uniform and image graced many of the advertising pieces of the day. On April 16, 1912, Quimby took off from Dover, England, en route to Calais, France and made the flight in 59 minutes, landing about 25 miles (40 km) from Calais on a beach in Hardelot-Plage, Pas-de-Calais. She had become the first woman to fly the English Channel. Her accomplishment received little media attention, as the sinking of the RMS Titanic on April 15 (the day before) upstaged her feat. On July 1, 1912 Quimby flew in the Third Annual Boston Aviation Meet at Squantum, Massachusetts. William Willard (the event's organizer) was a passenger in her brand-new two-seat Bleriot monoplane. At an altitude of 1500 feet the aircraft unexpectedly pitched forward for reasons still unknown. Both Willard and Quimby were ejected and fell to their deaths, while the plane "glided down and lodged itself in the mud." The Old Rhinebeck Aerodrome's restored and flyable Anzani-powered Blériot XI, which bears the Blériot factory's serial number 56, and the still-current registration number N60094, could possibly be the aircraft that Quimby was flying in 1912 during the Boston Aviation Meet. The previously wrecked aircraft that is now flying at Old Rhinebeck was found stored in a barn in Laconia, New Hampshire in the 1960s and fully restored to flying condition, most likely by Cole Palen, ORA's founder. A 1991 United States airmail postage stamp featured Quimby. She is memorialized in two official Michigan historical markers, one in Coldwater, and one at her birthplace in Manistee County, Michigan. View the full website biography of Quimby, Harriet.